An ATR-72 passenger plane was destroyed in an accident shortly after takeoff from Tyumen Airport (TJM), Russia. According to the airline, UTAir, there were 39 passengers and four crew members on board. The Ministry of Emergency Situations reported that 12 passengers sustained serious injuries. One of the survivors died on April 12, another one on April 19. Flight 120 took off from Tyumen Airport runway 21 on a regular domestic passenger flight to Surgut (SGC). The ATR-72 climbed to a height of 210 m and then banked 35° left, followed by a 50° right hand bank. It then struck a snowy field approx. 1,6 km past the end of the runway, broke up and a fire erupted. The Interstate Aviation Committee stated that both engines were working properly at the time of the accident. The Federal Air Transport Agency reported that the airplane had been parked outside for eight hours in weather conditions which included snow and temperatures at and just below freezing level. The airplane was not de-iced prior to departure and the crew did not insist on being de-iced. The immediate cause of the ATR 72-201 VP-BYZ aircraft accident was the PIC's decision to takeoff without de/anti-icing treatment despite the fact that snow and ice deposits were present on aircraft surface and were discovered by the crew members during taxi which resulted in degradation of aircraft aerodynamic performance and stall during climbing after takeoff as well as inability of the crew to recognize stall and, consequently, failure to undertake recovery procedure. The aircraft stall occurred at the operational angles of attack right after flaps retraction with engaged autopilot before stall warning system activation and was caused by the loss of the wing lift effectiveness due to takeoff with non-removed ground icing. The system cause of the accident were shortcomings in ground handling activities and staff training in UTAir-Technik that became possible because of absence of due monitoring by the Technical and Operation Supervising Directorates of UTAir airline for compliance with airline requirements regarding ground handling and aircraft ground icing protection which resulted in erroneous evaluation of aircraft conditions by the PIC and aircraft mechanic (the shift head kept himself aloof from monitoring mechanic's activities) after the aircraft has been on ground in icing conditions for a long time and in release the aircraft to fly without de/anti-icing treatment. - The shortcomings in the UTAir safety management system, which contains, all in all, general issues only and is not adopted for the implementation of Airline activities in particular areas, which did not allow to reveal and correct existing safety risks in a timely manner. - The shortcomings in the UTAir-Technic quality management system, resulted in neglecting of certain requirements of the UTAir ground handling management manual regarding staff training and monitoring for aircraft de/anti-icing treatment which led to the situation when not sufficiently-qualified staff performed the evaluation of the aircraft surface conditions and made the decision on need for the aircraft to be de-iced/anti-iced. - The absence at the time of the accident of basic regulations in force that establish state requirements for ground handling (de/anti-icing treatment in particular) including staff training and organization licensing. - The shortcomings in crewmembers initial and recurrent training as far as the danger of ground icing, its influence on the aircraft aerodynamic performance together with aircraft anti-icing system operation features and design are concerned that did not allow the crew to make the only appropriate decision to return for de-icing/anti-icing treatment after the observation of the snow and ice contamination on the wing after anti-icing system activation in de-icing mode while taxiing for takeoff. - The methodological imperfection of the crew computer based and simulator training programs concerning the prevention of aircraft stall, identification of approach to stall and taking timely actions for recovery. - The increasing need for number of flight crews to perform highly growing flights schedule which, with ineffective SMS, resulted in flight instructor work deficiencies during PIC training and absence of PIC skills to take correct decisions and to strictly comply with the regulations in force. - The possible fatigue of the crew members due to the violation of the work and rest balance while performing split flight shifts together with a large number of unused days-off. The Federal Air Transport Agency issued a telegram on April 2, to remind airlines and flight crews about the importance of de-icing prior to departure and to be aware of the meteorological conditions in which icing can occur. Another telegram was issued on April 6 with more specific recommendations for training and adherence to icing regulations. 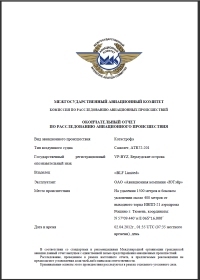 On April 9, 2012 Russian aviation regulator Rostransnadzor has suspended the operations of UTAir ATR-72 turboprop aircraft and also suspended the activities of UTAir Technik at Moscow's at Vnukovo Airport. An inspection of UTAir flight operations at Moscow's Vnukovo Airport revealed that four ATR-72 planes of the airline departed without being de-iced. The weather at the time was conducive to icing. The inspections were initiated by Rostransnadzor following the fatal accident on April 2 involving an ATR-72 of UTAir near Tyumen Airport (TJM), Russia. Distance from Tyumen-Roschino International Airport to Surgut Airport as the crow flies is 645 km (403 miles).